Two sets of six prints by a master serbian print-maker and professor living and working in Belgrade. Each is a graphic hybrid of identical dimensions (1,44 x 96cm), a large silk-screened print composed from four equal parts, each containing 6 mini images. 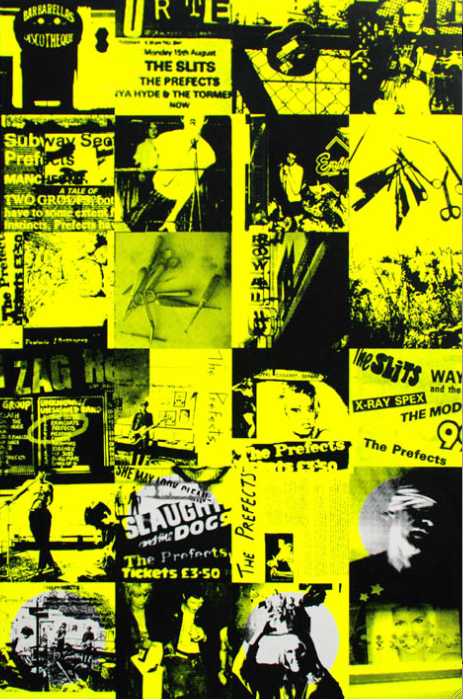 The end result is a grid of 24 where photographs, text and hand-written lyrics are presented simultaneously, as identically-sized pictorial equals with no centre or hierarchy. Colour is simple but produces contrasts that clash so the total effect is intricate and powerful. 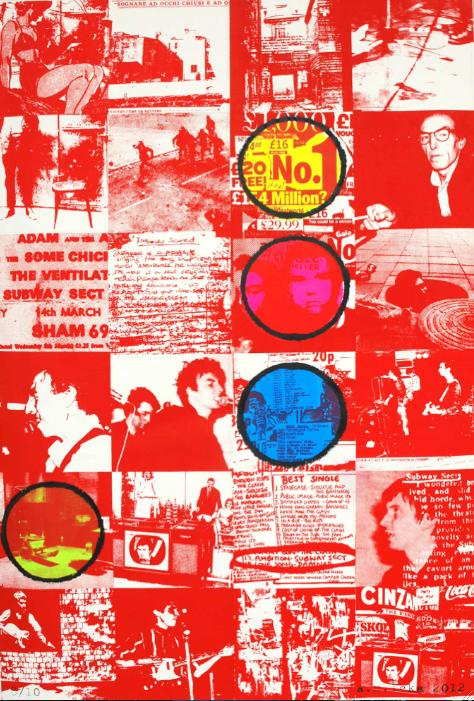 Colour and print are used to mesh together a variety of materials relating to British punk, and more precisely to Vic Godard and the Prefects. Leka is seeking a visual equivalent to music and to the sound of the songs referenced in the imagery. Thus, the regular bullet-like circles – 3, 4, 5 or 6 – reproduce the chord of a guitar superimposed upon the imagery as printed coloured sound. 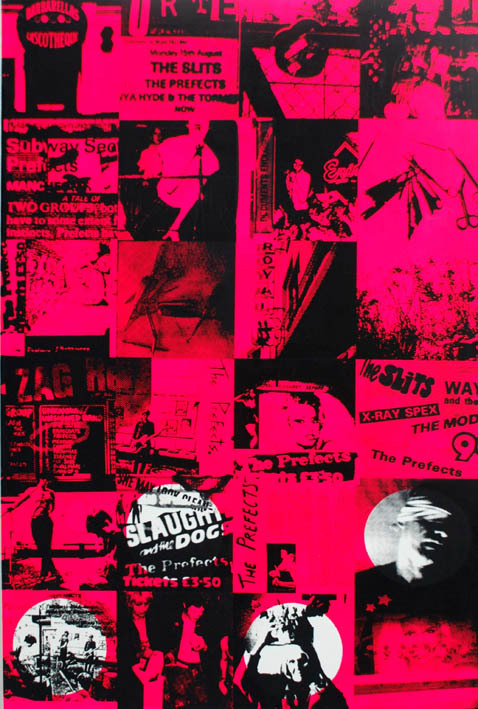 The consistent imposition of order upon an imagery of disorder, anarchy and rebellion is carried over in the precision of the titles (Subway Sect-Nobody’s Scared, Chord B flat or The Prefects-VD, riff E5 A7-E5 A3). These ambitious prints were the subject of a solo exhibition at the Ulus Gallery (Belgrade) in 2012 and can now be seen, along with other recent works, in the artist’s studio, by personal appointment. Leka is a Professor at the Printmaking Department, Faculty of Fine Arts, University of Belgrade, see www.amleka.com. Thank’s Emily, so do I! These works have such beauty. There’s a measured anger that combines with the overall concept making for a complete emotional experience. I find I’m drawn into each piece and can spend huge amounts of time just “experiencing” the emotion that each one provokes. I am not indulging in hyperbole when I say that I am blown away by these wondrous works of genuine “emotion art”. Art you can feel, art you can experience. This is genius – no less. Genius. Pure unpolluted genius. I feel privileged to have been allowed to bathe my senses in this experience. Thank you for creating and showing these beautiful works. More power to you, and May The Goddess continue to Bless You with your wondrous creativity. Blessed Be, Love and Light from Yorkshire. Rev Brad.